Sig Sauer P320 Maine - FAMILY: P320 Series MODEL: P320 Compact TYPE: Semi-Auto Pistol ACTION: Double Action Only FINISH: Nitron STOCK/FRAME: Polymer Frame STOCK/GRIPS: Polymer CALIBER/GAUGE: 9mm CAPACITY: 15+1 # OF MAGS: 2 MAGAZINE DESC: 15 rd. BARREL: 3.9" OVERALL LENGTH: 7.2" SIGHTS: SIGLITE Night Sights ADDL INFO: Interchangeable Polymer Grips. 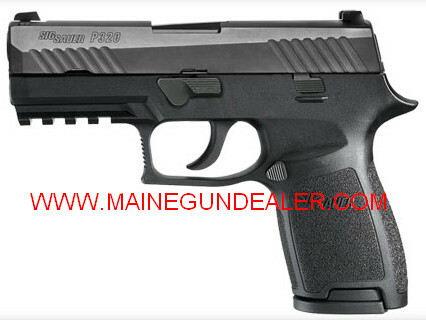 Related Products - See examples of some great accessories to go with this firearm below. We offer many factory and aftermarket accessories for the firearms we sell. See more accessories on this website. Not all of our products in stock will be listed on this website as inventory and products we carry will change.